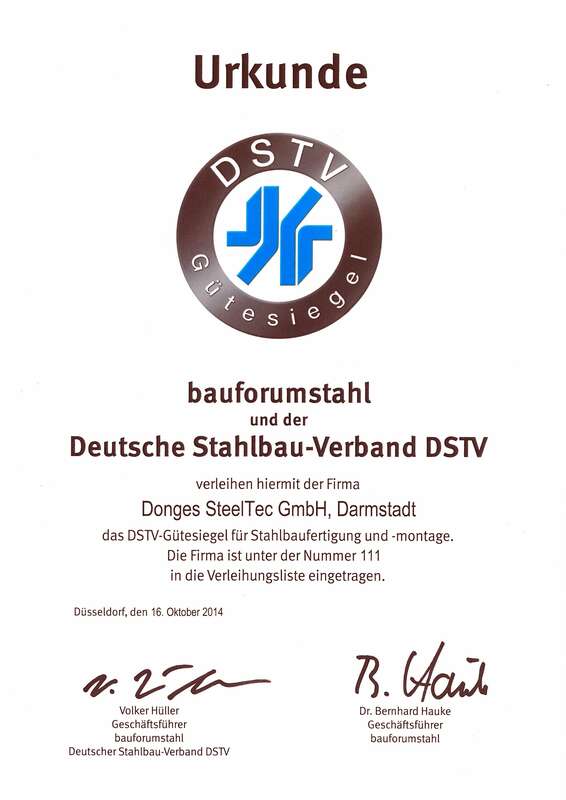 Over 140 years of experience in structural steel engineering, innovative designs and buildings and a highly motivated and competent workforce: Donges SteelTec GmbH in Darmstadt. 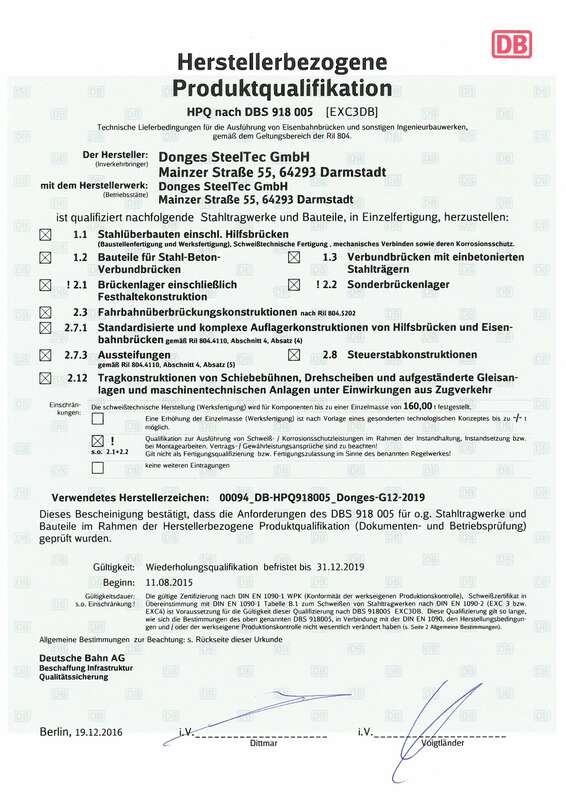 The range of our company’s business activities includes the planning, development, design, fabrication and assembly of architecturally sophisticated projects in the fields of steel bridge construction, steel structural engineering, as well as industrial facade and turnkey construction, and with its references, it is one of Germany’s market and technology leaders. 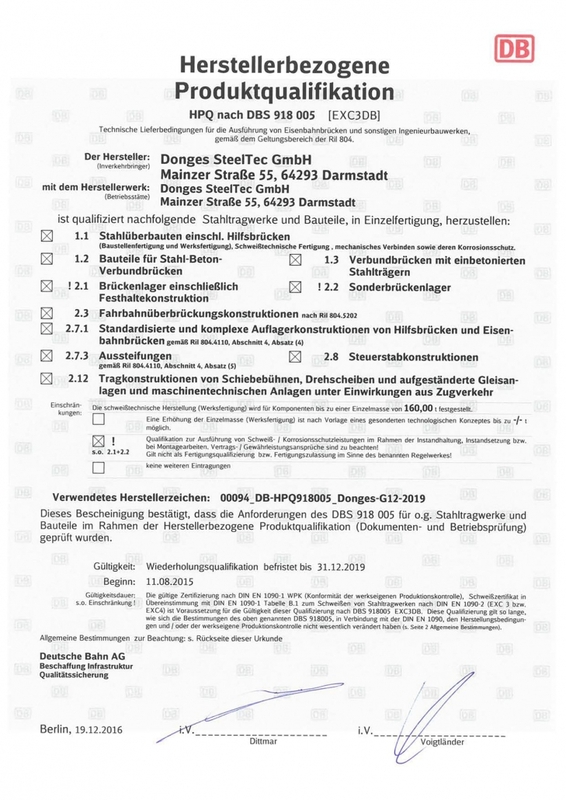 The history of the company can be traced back to 1872, when Georg Donges founded a locksmith business. Up until 2008, Donges was a family-run business. From 2008 to 2017, Donges belonged to the globally active Japanese Group, Mitsubishi Hitachi Power Systems. 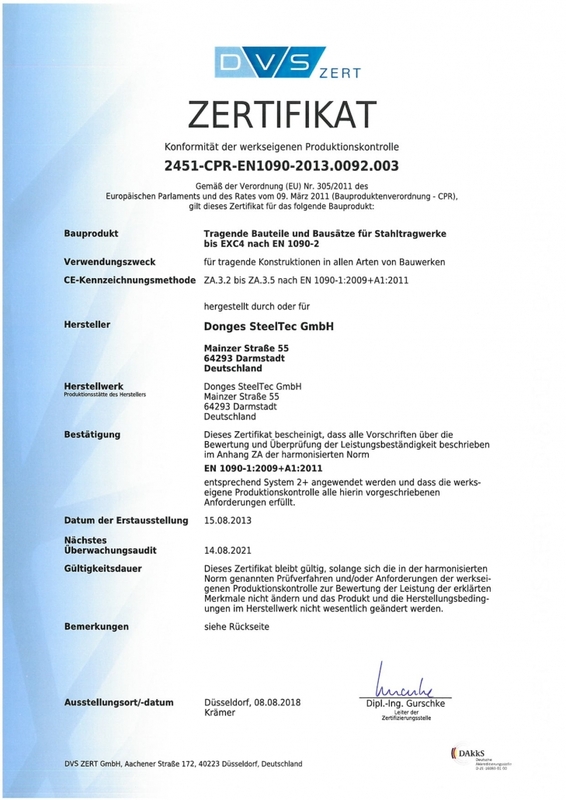 Since October 2017, Donges has been part of the Munich-based Mutares Group. 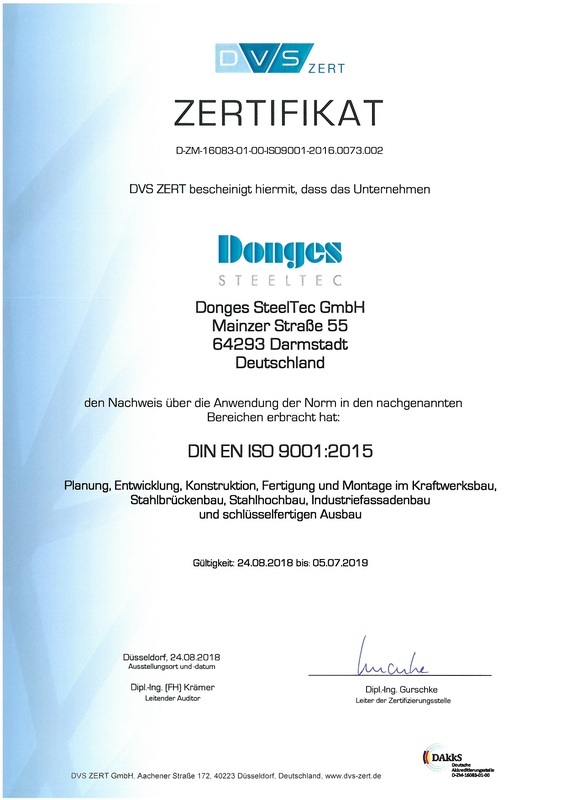 The acquisition of Kalzip in Koblenz (July 2018), Normek OY in Finland (February 2019) and FDT Flachdach Technologie in Mannheim (March 2019) marks the repositioning of the Donges Group as a specialist supplier of steel bridges, steel structures, roof and wall solutions on the European market. 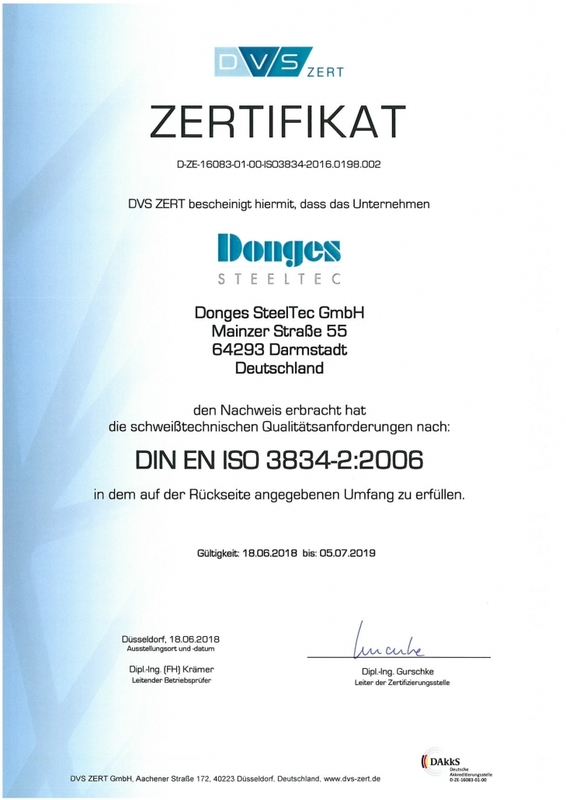 Donges is continuously adapted to the requirements of modern technology and has a production facility at its headquarters in Darmstadt with its own workshops on asite of 65,000 square-meters. With 200 highly-qualified, experienced employees, we offer our customers services involving all aspects of construction projects from a single source, from project planning, structural engineering and design, right down to fabrication and assembly. The annual production capacity at the Darmstadt plant is approx. 20,000 metric tons. The technical expertise and experience of our company is manifest in the completion of many major projects and outstanding buildings such as the curved steel structures of the Berlin Central Station, the Porsche Museum in Stuttgart, the Stuttgart exhibition center’s multi-level parking garage, the Wesel Rhine Bridge, the Schönebeck Elbe Bridge, the stadium roof of the Rhein Neckar Arena (TSG 1899 Hoffenheim), the coal-fired power plants in Wilhelmshaven, Rotterdam, as well as in Kusile and Medupi in South Africa, or the launch table and umbilical mast of the ARIANE 6 launch site in Kourou, French Guiana. 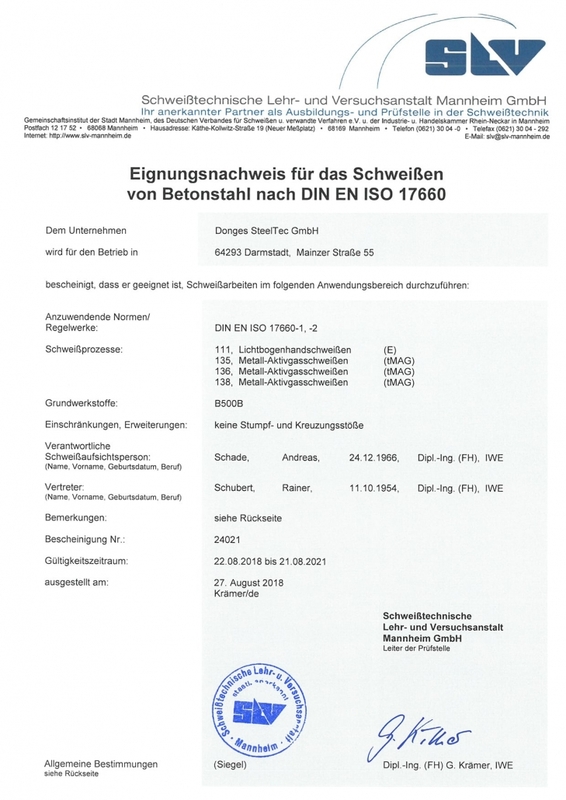 If you would like to learn more about the history of Donges, you can read more about it here. 1872 to 2007 Donges Stahlbau GmbH, family-run business; 2008 to 10/2017 Donges SteelTec GmbH, member of the Mitsubishi Hitachi Power Systems Group; since 11/2017 part of the Munich-based Mutares Group. 2018 and 2019 Expansion of the product portfolio through the strategic acquisition of the companies Kalzip, Normek OY and FDT. 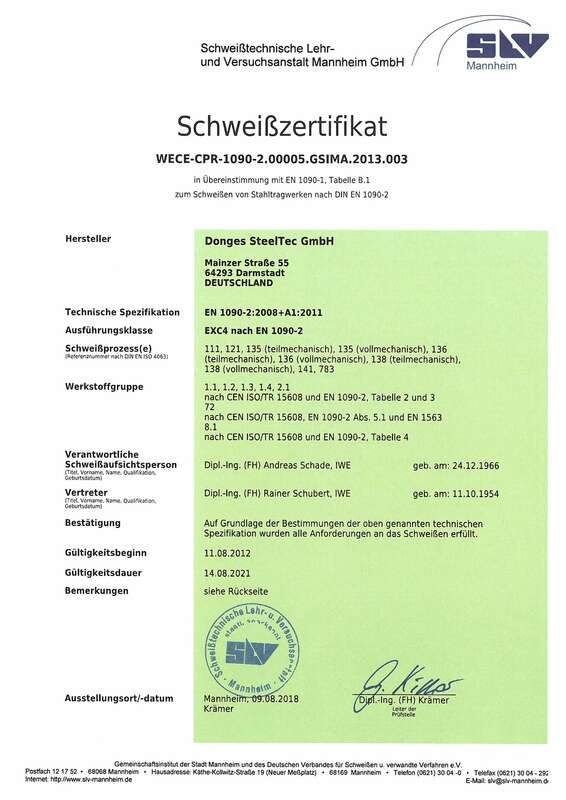 The high standard of our quality and process management provides for a high degree of customer satisfaction, boosts our company’s competitiveness in the steel construction market and leads to the continuous improvement of our internal procedures and processes, in addition to optimizing the use of resources. 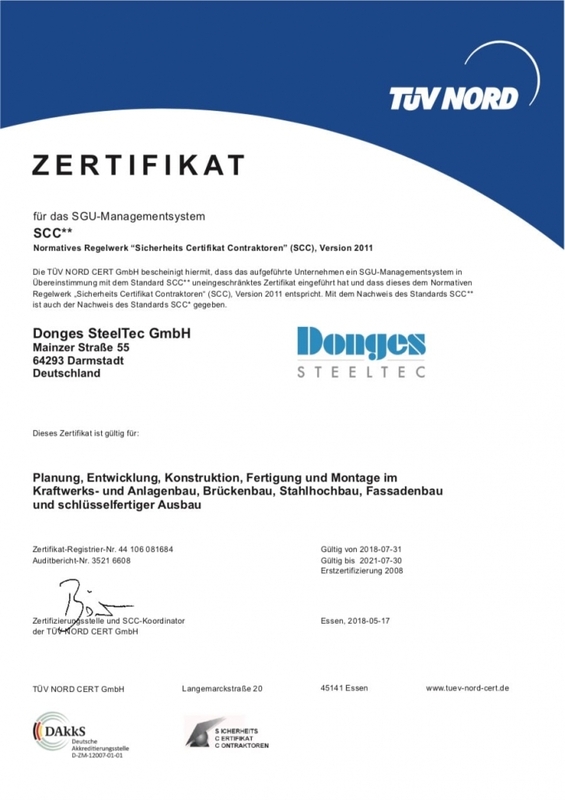 Donges SteelTec possesses all manufacturer qualifications required for planning, development, design, fabrication and assembly in steel bridge construction, steel building construction, industrial facade construction and turnkey development.